Each DD Network Newsletter will highlight a staff member from one of the partnering agencies to recognize their hard work and dedication in exemplifying the mission of the Network to work collectively and collaboratively to foster the independence, advocacy and community integration of individuals with developmental disabilities. 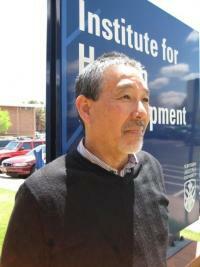 This Summer 2012 edition spotlights NAU Institute for Human Development Associate Director, Tom Uno. Tom has been working in the field of developmental disabilities for over 30 years. He has had the privilege of working in all three programs that are part of the Developmental Disabilities Act of 2000. Tom did his graduate work at Peabody College at Vanderbilt University and received his Ed.S. degree in the late 70's. While attending graduate school, he worked with the state Attorney General's Office working on a lawsuit related to the treatment of juvenile offenders who also had disabilities. He assisted the attorneys' on the case with managing and coordinating the expert witnesses that worked with the state on the lawsuit. After graduating, he worked with the Kentucky Protection and Advocacy Office located in Frankfurt, Kentucky. His primary responsibility was serving as an institutional advocate for the residents in large state ICF-MR facilities. After working there several years, he moved back to Hawaii where he took a position with the State Governor's Council on Developmental Disabilities. He eventually worked as the Executive Director for about 2 years. From the DD Council he took a position with the State Developmental Disabilities Division as a planner in the Department of Health. He worked there until the Director asked him to work on a special assignment with the VP of Academic Affairs at the University of Hawaii to develop and submit an application for at that time to become a "University Affiliated Program". Working with consultants and the University, a proposal was submitted and was awarded in 1989. Once the state was awarded the grant, he took the first position at the UAP and began the process of hiring a director for the program. Tom continued to work at the university as the Administrator for 8 years until he took his current position as the Associate Director with the Northern Arizona University, Arizona University Center on Disabilities. Tom continues to work on program development within the University Center of Excellence in Developmental Disabilities and enjoys working with families and consumers, and with public and private service agencies in the field of disabilities throughout the state.